Is your child also active on Facebook every time? Are you concerned about what they do over Facebook and whom they chat with? So you are at the right place. SpyApps is one of the best software available in this era of digital technology. Install this application over the phone which you wish to monitor, and get the complete details of things which are taking place over Facebook in real time. Now you can hack Facebook Messenger conversations of anyone without getting their password. What are SpyApps and its Facebook hack feature? To overcome the challenges faced by parents and partners in today’s era, we have designed this amazing software which comes up with various features of spying. You just have to install this application on the target phone, and then it will record, collect and organize the overall activities taking place over the phone. As we are majorly focusing on Facebook hacking, you can get details of text audio and video conversations along with tracking information about their multimedia files. Now you don’t have to ask your partner for his Facebook password as you can easily check out his friendship details with any stranger. Your trust can no longer be betrayed as you have this application in your hand which keeps your loved ones under your surveillance. Get text messages– one of the most impressive features of Facebook is that, it allows the users to converse with one another with the help of internet easily. The Facebook messenger is the latest feature of Facebook which is basically designed to facilitate chatting. This feature is very attractive as it has various customizable themes and colors, but lots of users misuse this. So to track all the Facebook texts, you can make the use of this application. You can get all the text details along with the profile of the other person and the time when the text was transmitted. Track multimedia files– Facebook also allows the users to share images, audio clips and involve into video conversations to their users. This application is largely in use as multimedia messages are more helpful in conveying your feelings and emotions. Through video calls, you can contact with anyone virtually and can get a feel of reality. So to deal with this amazing feature and its limitations, we have come up with the SpyApps. It will never let down your hopes and will allow you to access all the multimedia files and details when they were sent, received and saved. You can also locate the sender and can know about their identity and public profile. By this features, you can make sure that your kid doesn’t sends or receives explicit content and falls into the traps of cyber crimes. Get access to friend list– people daily receive a lot of friend requests from known or unknown users. Your kids might be using Facebook daily but don’t know the disadvantages of it. So you can now track their activities and can check out that who sends and receives friend requests from the target device. This feature is the most essential as people get more close to one another after they become a friend on Facebook. So through this, you can even block the unwanted account users who are friends with your children or partner. Check out the status updates and timeline details– the timeline and status update feature of Facebook helps the users to upload their location, feelings or activities in the form of status. This is different from the text messages feature as it helps the users to put down one status which reaches to everyone added to their friend list. Through SpyApps you can easily hack Facebook statuses and timelines details. You can explore their activities by accessing their location details uploaded on Facebook. Get details of personal information updates– it is always recommended that users should not upload their personal images and details over Facebook. Cyber bullies are always in search of those profiles wherein the details are set to public. This means they can save all the images and videos shared by an individual. So you can now easily check out that what pictures the target Phone user uploads over Facebook. You can see their privacy settings and can ask them to change it. This can help you to protect your children from online threats and to blackmail. Listen and view audio and video calls– since Facebook messenger evolved, it brought a revolution in the world of connectivity. Through the widespread internet network, the users can also make calls through messenger. These calls include both the audio and visual calling features. But through the help of SpyApps, now you can easily access the calls which were made through Facebook messenger. Even if the user deletes the call details, you can still listen to them as they get instantly uploaded to our server. You can access these calls through your online account linked with the target phone and can find out what conversations are going on behind your back. Location tracing– apart from monitoring the activities of a user over Facebook, you can also detect and monitor their periodic location in real time. This means that with the help of GPS and internet availability this app can continuously track and locate them wherever they go. So now in a situation of any emergency or problem, you can immediately rush to protect your family members. This feature is also useful to trace your employees if they waste the valuable working hours and make use of the official vehicles to fulfill their tasks. Now you can easily find out that how much time your child or partner spends at a particular place. Check internet usage on other apps– just like Facebook; there are numerous other applications which are available on the internet. They facilitate the users to make unlimited calls, send texts and do everything which you can do on Facebook. So it is essential that you must get software which traces details of every single application installed on the phone, and yes, we can do this for you. We will help you to monitor the details of internet usage. You can now find out the browsing history and determine that what other applications or websites are surfed by your child or partner. You can also block any of these websites if you wish to. Surround sound capturing– this feature of our software will facilitate you to dial a fake call on the target phone user. By fake call, we mean that you can anonymously make the call and you will not be recognized. The call will be received automatically due to the presence of our application, and you will get to hear everything which is being talked around. The upgraded technology of this app detects and records even the minute noises in the environment. They also get recorded and uploaded on the server. So even if you are busy, just make a call and keep the phone as it is all the sounds will be recorded and are accessible later on. Ensure security through remote controlling– well your main aim of reading this article must be to get a perfect app to hack Facebook. But it is essential for you to get an app with such additional features. This feature is purely essential and unique. It can let you ensure the security of your mobile phone every time. Due to the presence of this feature, we recommend you to install it on your device as well for safety purpose. So now whenever you have to travel long distances for business or just leisure use, you don’t have to care about the security of your phone. All the data will stay hidden and protected due to which no one else can access it without your permission. Undetectable application– a major benefit of using our application is that your identity will never get revealed. If a person gets to know that his phone is under surveillance, it is surity that they won’t like this. So this application, once installed on the target phone, stays hidden. The user will not get to know that he is being monitored, and thus, there won’t be chances of any complication in your relationship. You can secretly keep an eye on them and can resolve all your trust issues. This will strengthen your bond and will also help you to safeguard your family from any external threats. Professional guidance and services– many of you may find difficulties while using this app. But we are always there to help out our valuable customers. You can drop us a mail or get directly chat with our expert’s panel in case of any problems. All your doubts will be cleared and you be guided at every point of time 24×7. You will even get instructions for downloading and installing the software over the device. So forget everything and download this amazing software through SpyApps to hack Facebook now. What is the importance and requirement to hack Facebook Messenger? Social media applications such as Facebook are very user-friendly, and anyone can access it through their desktop or mobile phone. Such applications are also downloadable free of cost with the help of internet. As the reach of the internet is increasing rapidly, it experiences millions of users every day. People can easily create an account over Facebook by providing their details such as name, date of birth and email account or mobile number. Therefore there are various fake accounts made by bullies and criminals as well. They send friend requests, especially to teenagers and pretend to have similar hobbies and interest, to trap them so it is essential that before the things go out of your control, you must get the SpyApps. Because without the help of a spy app, you can never find out what’s going on over a phone. Until and unless your partner or child is extremely close to you and you people maintain a friendly relationship with one another, they will never share each and everything with you. But with the use of this software, you can anonymously get in touch with them. You can even locate them and can protect them if an emergency situation arises. It will also help you to protect your loved ones from online threats. You can maintain their privacy and security by guiding them on every facet of life. Protection of the mobile phone and data- explained in one of the above-mentioned features, this software can help you to keep all your mobile phone data secure from rivals. Therefore you can even install this software on your phone. If you don’t wish to monitor someone but have got multiple professional data stored in Facebook, which requires high security, then you must get this software. You can easily maintain the safety of your data and information. Also, if you forget your phone somewhere or it gets robbed by someone, you can still locate your mobile phone immediately and can get the overall details such as the location of the phone, and what activities are being performed on it. You can easily catch the culprit in such scenario. Catch cheating partner– if you also have trust issues in your relationship, then you can install this application on your partner’s device. Now whenever they access their Facebook account and make new friends over Facebook, you will get to know all such things through notifications. The conversations which start over Facebook usually end up in real life meetings. So if you don’t want that your partner gets attracted towards someone else, you must install this app. You can monitor everything in the virtual stage itself and can stop things from going on next level. You can warn your partner and can catch them up immediately if you get betrayed. Catch your employees– as you are already well aware of the various fraudulent activities which are taking place every day, you must always take every step after full understanding and knowledge about a person. This means that there would be many people who are jealous of your success in the personal and professional era. Some of them may even work in your firm by changing identities. So through the help of this spy software, you get the benefit to trace their activities and movements. Now you can catch those employees who don’t respect the rules and regulations of the firm and don’t work on time. All those who are not sincere towards the job and waste time over Facebook or other apps in chatting will be easily identified. Guide your children– through studies and researches it has been found that, most if the social media victims are kids and teenagers. As they are new in this world of technology and are experiencing exciting things for the first time, they easily get fascinated and fall into the traps of the internet. Being a parent, it is your responsibility to always show the right path to your kids directly or indirectly. This software is an amazing way of doing so. Now you can easily keep an eye on your children and can hack Facebook accounts of them, without even requiring the password. This will help you to ensure their protection from any social media threats, cyber crimes, and online bullies. Thus, you must definitely get this software installed on their devices. Application for both android and iPhones- the compatibility of this amazing software can never be questioned. It is completely compatible with any of the Android or iOS devices. Once the application is installed, the phone will work as good as it was working earlier and the software will stay undetectable. So, you have to visit our website and go through all the authorized policies and rules of our software. We don’t promote any fraudulent activities, get yourself registered before you wish to choose any android or iOS service of our software. After getting the details of all the features and benefits of our software, you must not even waste a single minute and should install it now. But before you do this, get yourself registered by giving your details as per the requirements. It is essential to produce the details of your relationship with the phone you wish to monitor. This is because there may be chances that an unknown person tries to install the application over someone’s phone. So if you have a close relationship with the mobile phone user, then only you can get access to this application. Apart from this, you can even enjoy our limited period free trial and hack facebook. You can personally experience the various features of our application and can put down your reviews. If you find the software useful, then you can purchase it for further use. This highly affordable application filled with latest technological aspects can help you to resolve all the problems which prevail in your life. Hey guys i really dont know about the scam of a thing but i recommend joecyberghost@gmail.com for a neat and perfect hacking job…he help me hack my ex’s email, facebook, whatsapp,and his phone last week cause i suspected he was cheating. all he asked for was his phone model, no physical contact.if you need help hacking any social site without password he will surely help tell him Linda referred you..he will surely help you out..you can thank me later ..
him to help me clone my husband cell phone and whatsapp. cash i saved for years as a student. I was always having these gut feelings about my cheating on me with her boss at work but i couldn’t confront her about it because i didn’t want to cause any problems where there’s none. Then my friend told me about an hacker that specializes in remote whatsapp messages access, mobile phone access , online game access , providing passwords to social network like Facebook, Instagram, twitter or anything regarding school issues, i didn’t contact him because I’ve been scammed twice by two fake hackers…At the end of the day, i contacted them and i was able to confirm the fact that she really was cheating on me with her boss at work after i was able to get access to her emails, text messages and also listen to her calls. Very big thanks to (B I R D E Y E . H A C K at GMAIL dot COM), he’s the definition of genuine and authenticity because he did everything he promised at the stipulated time…!! I was reading through an article here I saw the good works about computer chaos club I which I did contact them via :+1(917) 283-6083)..I really do appreciate we still have legit hackers out there my ordeal for 1year ended when I came across this good hacker for everyone out there who is in need I just found a way out of my ordeal . If you are trying to catch your cheating spouse, I recommend that you contact the hacker that helped me monitor my husband’s phone when I was gathering evidence during the divorce. I got virtually every information he has been hiding over the months easily on my own phone: the spy app diverted all his whatsapp, calls, text, facebook, text messages, sent and received through the phone: I also got his phone calls and deleted messages. he could not believe his eyes when he saw the evidence because he had no idea he was hacked.. if you need any type of hack you can contact him. Contact: computerguru146@gmail.com. if you need the service of a professional hacker for hire for any form of hacking exploits of any such you can reach out to areaview.hacker at GMAIL d0t C0M he is the best for any form of hacking exploits, he was able to hack my husbands phone under 24hours. You could indulge him if you desperately need answers ASAP. I wish to publicly appreciate the efforts of one of Russia’s greatest hackers by the name Verenich Fedorov. I contacted him about three months back from Texas when i needed access to an entire cellphone. He did something he called R.C(Remote Cloning) and granted me access to the targets Facebook,whatsapp,emails,text messages,twitter,call logs,instagram and other apps on the cellphone without me touching the phone, i received all the information on my own phone. He is simply amazing in many other areas of hacking. *Money transfer and so many other services. 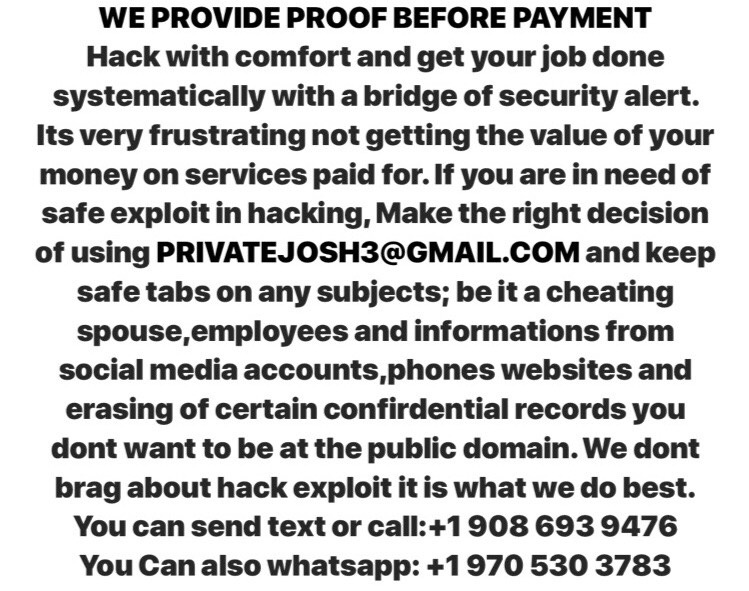 He is also a genius at -Social media hack(Facebook,Whatsapp,twitter,emails,instagram) -Website hack -Credit score hack -Medical records hack -Changing university grades -IP tracking -Recovery of lost accounts or documents and many other services. Need a hacker? I was in a tough spot and didn’t know what to do until a friend recommended this cyberintelligent13 AT gmail DOT com,I was pleased with his professionalism him help me spy on my husband without any touching his cell phone and thoroughly satisfied with how he handled it. Hello, Do you need a hacker for specialized hack jobs, hack into email accounts (gmail, yahoo, aol etc. ), gain access to various social networks (such as facebook, twitter, instagram, badoo etc. ), specialized and experienced hacking into educational institutions, change of grades, clearing of criminal records, smartphone hack. contact CyberhackgeniusAThotmailDOTcom. He helped me. He can help you too contact him +1(916) 6742172.He has proven to be efficient to his jobs.? I told my best friend and colleague about my situation and he introduced me to this professional ( PRIVATEJOSH3@GMAIL.COM ) who he has been working with for months. Mr Jeremie is a genuine professional and I cannot thank him enough. SCAMMER ALERT !! A real hacker is not worth so many words, but proofs and does not need these advertisements. You are also a cheater, because you advertise a fake hacker, to take other people’s hard earned money for free and can’t do nothing, except for run away. FAMOUS AND PATHETIC SCAMMER who also lack skills in presentation and answering basic questions… plus can’t get a grip of a damn customer because nobody trust him and he is been exposed by many. No … I don’t allow fake hackers to get attention and money this way. Can you help? He can’t even explain his job properly. Let alone hacking. Barks at his clients when they ask for refund when work does not get done. Abusive verbally. Loser who has no skills. Gets scared easily when you want to expose him. Lol STFU with godgift11544, he is proven guilty many times, do have shame !! BIG SCAMMER with multiple accounts !! Using many accounts to promote 1 person all over the net because not got a damn customer due to 0 skills !! Stfu. Facebook Is one of the most highly protected website on net due to its size and worth. But i was able to gain access into my wifes facebbok account through the help i got from Mr John. Hello everyone, I had doubts about my partner, so I sought help, then I was introduced to GODGIFT11544@GMAIL.COM by a friend and he helped me in gaining access to my ex’s email, facebook, whatsapp, and his phone records. All he asked for was his phone number. And As a parent, if you want to know what your kids do on a daily basis on social networks (This includes facebook, twitter ,instagram, whatsapp, WeChat and others to make sure they’re not getting into trouble, Name it, he can get the job done. He is a Professional Private Investigator. Contact him via his email if you need his help, he will be glad to assist you: GODGIFT11544@GMAIL.COM. I got great hacking services from russian.h@programmer.net, he is genuine and reliable. We are perfect and good if you want to hack your husband facebook account. just contact us through our gmail now we are available to work for you perfectly. 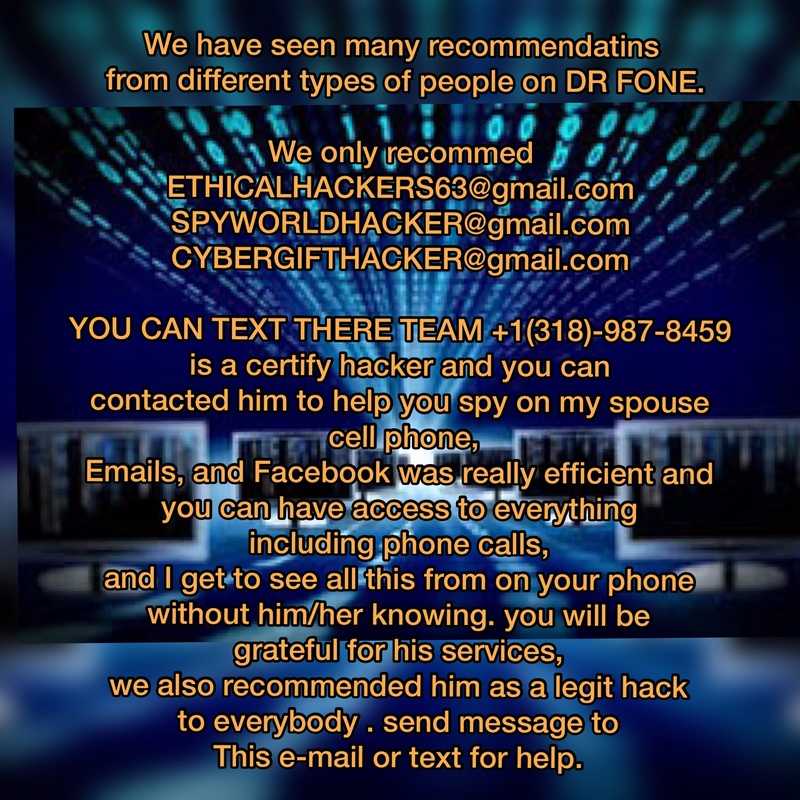 HELLO EVERYONE, CONTACT THE EMAIL ABOVE TO HELP SPY ON YOUR PARTNER’S CELL PHONE REMOTELY, CHANGE YOUR GRADES OR BOOST YOUR CREDIT SCORE, CONTACT FOR OTHER PROFESSIONAL HACK SERVICES. thanks for helping me, God bless you.. you are a good man.. Personally I see no point in deluding yourself which is why I hired and I have never had to regret working with a hacker called cyberhackmaniac50@gmail.com he has helped me get some secrets out and the closure I needed because my life was in shambles and never failed me since then. He is good in all sort of hacking, Just assume he can do anything online. Tracking down her messages and incoming/outgoing calls gives you a complete picture of her activities and lies, all you need to do is hire the best and legit hacker ETHICALHACKERS63 @ gmail. com for the best result. Hello everyone are you in need of any professional hacking services you want to spy,monitor,kik,whatsapp,facebook,instagram and Snapchat. And you wish increase your bad credit score and also upgrade of school grades. They’re the best you can ever come across and work with at affordable cost and they’ll deliver your work in few hours. CONTACT US FOR FACEBOOK HACK AND OTHER MOBILE HACK, OUR SERVICES ARE TOPNOTCH.